Use of the Armstrong drywall grid system instead of metal studs cut installation time of the framing in half. The University of Toronto (U of T) recently completed construction of a new addition to its School of Architecture. The top floor of the new Daniels Building facility features an expansive 1486-m2 (16,000-sf) open space designed to function as a studio and study hall for the students. The space features no interior walls or structural columns. Towering above the massive space is a contemporary drywall ceiling designed to replicate wings reaching eastward and westward, away from the north-facing glass curtain wall. 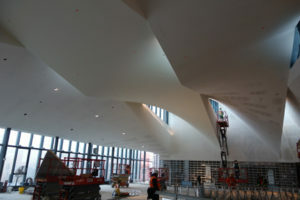 Hyperbolic paraboloid in shape, four angled drywall ceiling slabs gently twist from one side of the space to the other. Since each ceiling surface has two pivot points on which it twists, establishing the correct set points to run the framing was difficult. 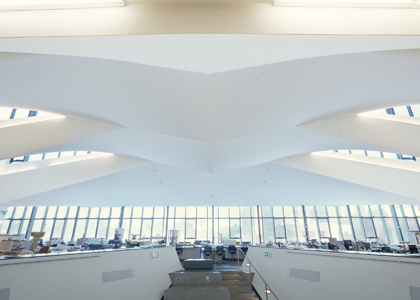 This drywall ceiling installation took gold in the central region in the education category at the 2018 Ceilings & Interior Systems Construction Association (CISCA) Construction Excellence Awards. Creating the complex framing on which to attach the drywall was a key installation consideration. Project designers initially considered using metal studs. However, a number of factors presented potential problems, including the overall size and twist of each ceiling surface. To find an alternative, the drawings were sent to Armstrong Ceiling Solutions to see if a drywall grid system was feasible. “We were familiar with drywall grid from a previous project and thought it would work here because of the flexibility it offered compared to metal studs,” he says. The drywall grid system maintained the curvature of the ceiling very well, even without wetting the 19 mm (5/8 in.) drywall. To ascertain the drywall grid would perform as desired, Armstrong created a full-scale mockup at the local union training centre using main beams, 1 m (4 ft) cross tees 406 mm (16 in.) on center (o.c. ), and 19 mm (5/8 in.) drywall. “The mock-up showed the framing was indeed possible using drywall grid and that gave us a level of confidence to proceed,” Dell’Elce says. 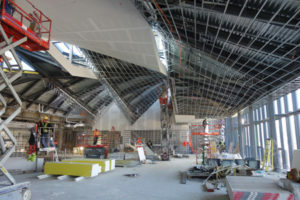 Following approval for its use, an initial challenge was the fact this would be the first time many of the installation crews would be working with drywall grid, let alone on such an unusual shape. To remedy this, Armstrong held onsite training sessions to help ensure a hassle-free installation. Due to the ease and speed of installation, he estimates the drywall grid system probably installed in half the time as the original steel stud system, thereby significantly reducing labour on the project. Morgan also notes the drywall grid system maintained the smooth curvature of the ceiling very well, even with 19 mm drywall. “We were surprised how well the drywall mirrored the curve of the ceiling without even having to wet it,” he says. The unique shape of the ceiling did present its own challenges. 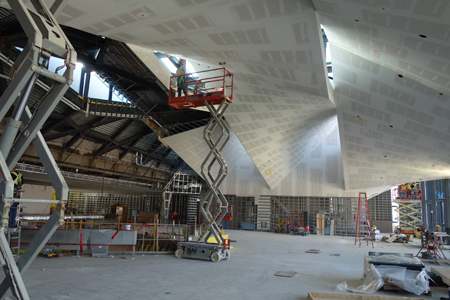 Since each ceiling surface has two pivot points on which it twists, establishing the correct set points to run the framing was among the most difficult challenges of the project. Another was the height of the ceiling, which rises to 9 m (31 ft) at its highest point. Especially difficult was installation of the ceiling over the staircase leading up to the space. Additionally, the floor featured a bubble deck construction, which limited the size and weight of the lifts that could be used. For additional information on Armstrong Drywall Grid Systems, visit www.armstrongceilings.com/drywallgrid. All information listed in this section was submitted by Armstrong World Industries.